Many factors contribute to successful ACL reconstruction and rehabilitation, but failure of even one of these factors can lead to less than desirable outcomes. When graft failure occurs, it is necessary to perform an ACL revision procedure. Revision surgery requires specialized techniques and instrumentation that we have optimized for our patients. Why do ACL reconstructions fail? ACL reconstruction is a complex process, and although the success rate of ACL reconstruction is generally 85 - 95%, there are times when the reconstruction is unsuccessful. Placement of the graft is the single most difficult aspect of ACL surgery. Tunnels are drilled into both the femur and tibia in order to secure the graft. Precise placement and orientation of these tunnels to achieve the exact anatomic location of the normal ACL are important for success. Slight variations in placement produce abnormal stresses and lengthen the graft. Improper alignment can result in impingement, which can sacrifice the integrity of the graft. It can also result in excessive laxity or decreased range of motion, both of which produce unsatisfactory results. Experience of the surgeon is of utmost importance but new computer-guided systems may help less-experienced surgeons improve their accuracy. The weakest link in the reconstruction is the point of attachment. The goals of fixation are to achieve sufficient strength and stiffness, and to avoid further complications such as inflammatory response or degradation over time. The fixation technique will initially need to secure the graft tissue in place while the graft incorporates into the bone tissue, which is the ultimate goal of the reconstruction. Of the many options for graft fixation, our preference has been to use bone-patellar tendon-bone grafts with interference fit screws. Generally, the fixation choice depends primarily on the type of graft material used. With patellar tendon grafts, either metal or bioabsorbable interference screws are used to secure the bony attachments on either end. 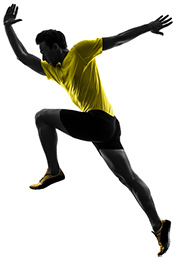 With hamstring tendons, which require securing soft tissue to bone, a variety of methods are used including cross pin, endobutton, screw and post, or belt-buckle staple technique – each can produce favorable results. Graft impingement occurs from entrapment of the graft in the intercondylar notch. This can occur from graft placement, variations in notch shape and size, and graft hypertrophy. If the graft is impinged, wear increases, length can increase, and failure can occur. Most commonly, decreased range of motion is noted. The treatment involves surgical debridement or graft re-positioning. Intrinsic failure of the graft can occur from graft impingement or trauma. Recent reports have noted a 2% traumatic rupture rate of autogenous ACL reconstruction and a 15% rupture rate for allograft. In the case of allografts, a low level of immunologic reaction can weaken the graft and cause early failure as well. Arthrofibrosis occurs in up to 10% of ACL reconstructions. The fibrosis is the formation of scar tissue after injury or surgery leading to decreased range of motion in the knee. This can be diminished by early and full range of motion exercises both before and immediately after surgery. Some people will develop the fibrosis no matter what procedures are followed. Generally, arthroscopic surgical debridement with a careful rehabilitation program will result in a successful outcome. Trauma can cause excessive force on the graft during the healing process before it has reached full strength. In addition, significant trauma after the full healing of the graft can cause rupture of the graft similar to rupture of the original ACL. First, the patient is prepared for surgery in a sterile manner, and arthroscopic portals are established to allow for visualization of the procedure and insertion points for the instruments. The patient's knee is evaluated within the joint and any scar tissue removed. The old ACL fibers from the failed graft are removed with a shaver and the intercondylar notch is cleared of bone and soft tissue. Precise placement is necessary for a successful revision. If the old hardware is in the way of the ideal tunnel placement, it is removed usually under fluoroscopic (X-ray) control. The anatomic insertion site on the femur for the original ACL is identified, and a drill hole is initiated using a gaff to place a rear-entry guide and is then drilled from outside in. The hole is cleared out and the edges are chamfered (rounded) to avoid damage to the graft. Next, the insertion site of the ACL on the tibia, on the tibial plateau, is identified, and a drill hole is initiated using a triangle-guide, again drilling from outside in. The hole is cleared out and the edges chamfered in a similar manner. The graft tissue, which usually is a bone-patellar-tendon-bone graft, is brought through the now continuous tunnel running from the femur through the knee joint and through the tibia. The tissue is secured in place using 9 x 20 mm screws, which bind the bone blocks at either end into the tunnel. The knee is finally brought through a full range of motion to visualize for any impingement of the graft and to ensure proper placement. The instruments are removed, the incision sites are closed, the joint is injected with Marcaine for pain relief, and the patient is able to return home later that day.